San Francisco based autonomous trucking startup Embark has nabbed $30 million in a Series B funding round led by Sequioa Capital and also being participated in by major startup incubator Y Combinator, SV Angel, Data Collective and Yahoo co-founder Jerry Yang's AME Cloud Ventures. This investment brings the total raised by Embark to $47 million with Sequioa partner Pat Grady also notable for other investments in various startups like Okta, data warehousing unicorn Snowflake, $1 Billion cloud communications startup Zoom and also Big Data startup Qualtrics joining Embark's board as the company aims to expands its input to develop a commercially viable driverless truck. 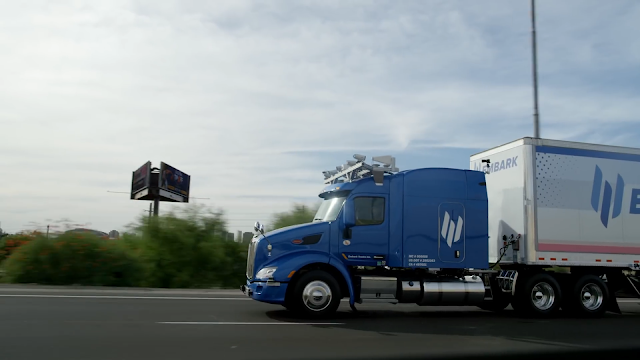 Embark will now have to scale its operations in a market which will see the 2 year old startup compete with the likes of Waymo, Uber and other autonomous trucking startups looking to different approaches to make autonomous trucking a fully viable services for consumers. Embark initially launched in stealth and debuted publicly last year February with the startup later raising $15 million in funding 5 months later from Data Collective, AME Cloud, SV Angel, YC Continuity and Maven Ventures, 4 of which notably returned to invest in this round. In a recent Medium post penned by Embark co-founder Alex Rodriguez, He stated "The last two years have been incredible, working on the kind of truly world-changing technology I’d always dreamed of, with a team of people I’m excited to see every morning. We’re thrilled to have Sequoia joining that team and working alongside us on our mission to transform self-driving from fantasy to reality." This investment marks an addition to Sequioa's recent kicking off of investments in the autonomous driving sector with the VC firm making its first investment in the space just last month leading a $9 million round for rideOS, An autonomous technology software startup founded by 3 former Uber executives. Embark currently counts quite a few 35 employees which it notes has put way more input in the company compared to its size which was one of the driving actions which led Sequioa to bet on its technology. Quoting Embark co-founder and CEO Alex Rodriguez "Two years after founding Embark, Brandon and I are excited to partner with Sequoia, tapping into their experience as early investors in Google, Airbnb, and Dropbox, among many others. In two short years, Embark has built a self-driving powerhouse from scratch. Getting an investment from the most successful venture firm in the world is a humbling validation that Embark’s ethos is working".